Thirty-two F1 Boer x Spanish (28.7 ñ 0.49 kg) and 40 3/4 Boer-1/4 Spanish (31.9 ñ 0.47 kg) wethers, approximately 5 months of age, were used to compare feeding systems with different dietary treatments. Feeding systems were Calan gates and automated feeding units allowing one animal to consume feed at a time. Two diets included concentrate (C) and two were dehydrated alfalfa (A), fed pelletized (P) or loose (L). The main effect of feeding method was not significant for any variable. There was an interaction in DM intake (DMI) involving feeding method, diet, and genotype, which indicated that with a concentrate diet, regardless of physical form, DMI was not influenced by feeding method. Main effect dietary treatment means (1.78, 1.67, 2.04, and 1.70 kg for C-P, C-L, A-P, and A-L, respectively; SE = 0.030) indicated that pelletizing had a slightly greater effect on DMI with A vs. C. ADG was lowest among treatments for A-L (212, 205, 190, and 157 g for C-P, C-L, A-P, and A-L, respectively; SE = 8.9), and ADG:DMI was greater for C vs. A (127, 120, 94, and 94 g/kg for C-P, C-L, A-P, and A-L, respectively; SE = 7.8). For wethers subjected to automated feeding units, the number of feeder visits was lowest among diets (P < 0.05) for C-P (23.1, 31.2, 35.7, and 35.7 per day; SE = 2.00); total feeder occupancy time per animal ranked (P < 0.05) C-P < A-P < C-L and A-L (74, 130, 105, and 122 min/day; SE = 6.8), and rate of DMI was greater for P than for L diets (24.6, 12.9, 22.0, and 13.7 g/min for C-P, C-L, A-P, and A-L, respectively; SE = 3.89). 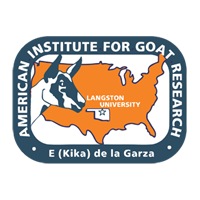 In summary, meat goats can markedly vary feeding behaviors in response to different diet types and forms; however, there appear limits to such changes, as exemplified by lowest ADG for A-L. Calan gates and automated feeding systems appear similar in the ability to compare growth performance with treatments such as the concentrate-containing diets and genotypes of this experiment. Most performance benefit in growing progeny from Boer crossbreeding may be achieved in F1 animals, with little further improvement realized from the first backcross of F1 females. Pelletizing does not seem to affect on growth performance with diets consisting of appreciable concentrate. Effects of pelletizing on growth performance of meat goats consuming forage diets may be attributable to change in level of feed intake, without impact on efficiency of feed utilization.